Club Penguin Cheats by Mimo777 Club Penguin Cheats by Mimo777: Jet Pack Guy Senses "Weird Energy!" 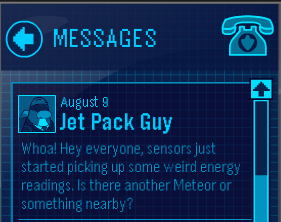 Jet Pack Guy has sent us a Club Penguin message! Oh great! Rookie is all pooped and now more work to do? What should we do? I bet it has something to do with Operation Blackout. Maybe Herbert floated away to another island and now sneaks back to Club Penguin with Rockhopper's ship. Herbert did make that cream soda bomb before. Maybe he needs Rockhopper's soda to make it again.